Happiness is not about wishful thinking, good luck, or avoiding negative thoughts. In fact, the only path to true happiness requires seeing challenges as opportunities and discovering emotional strength during times of struggle. In other words, it's about resilience. Resilience is a quality most of us want to possess. The big issue is that no one knows how to access it in their day-to-day life. We understand that it's important, that it's crucial even, but it seems like an ephemeral thing that you either have or you don't. How we actually attain the skills to become resilient has been left out of the conversation. Until now. In 21 Days to Resilience, Dr. Zelana Montminy, a leading expert in positive psychology, offers a practical, science-backed toolkit to develop your capacity to handle whatever life throws your way--and thrive. Each day of her powerful program, Dr. Montminy introduces a key trait necessary to improve resiliency and enhance wellbeing, such as gratitude, focus, playfulness, self-respect, and flexibility, then provides three simple tasks to accomplish that day--one in the morning, one during the day, and one in the evening. In addition, the book offers a "Take Stock" section that will help you gauge your current level of skill and each chapter ends with a "Lifelong" exercise that offers ways to build the skill as needed to keep your resiliency muscles strong. Dr. Montminy writes, "Being resilient does not mean that you won't encounter problems or have difficulties overcoming a challenge in your life. The difference is that resilient people don't let their adversity define them. At its core, resilience is about being capable and strong enough to persevere in adverse or stressful conditions--and to take away positive meaning from that experience. Living with resilience is more than just bouncing back; it is about shifting our perceptions, changing our responses, and growing from them." 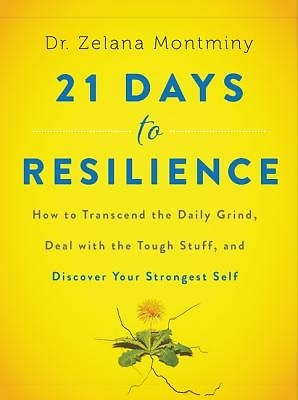 Combining proven science, unique exercises, and insights from real-life experience, 21 Days to Resilience lays the foundation for happiness and shows you how to build your strength to carry you through the rest of your life.